Snow causes flight disruption and traffic accidents on JejuThe snow started on Feb. 3 and is expected to continue until the afternoon of Feb. 6. On Sunday, more than 200 flights were canceled or delayed, and around 250 people are thought to have had to stay overnight at the airport. These people were provided with water and blankets. There are expected to be an extra 34 flights put on today (Feb. 5), although continued heavy snowfall has seen many flights be delayed. This is the second time this year that snow has caused problems at the airport after heavy snow in mid-Jan saw around 7000 people stranded on the island. The airport isn't the only place to have been hit by snow on the island and Mt. Hallasan reportedly saw around 90cm of snow last night. This has lead to the closure of roads on Jeju's upper regions including the 1100 road, Bijarim-ro, and parts of the 5.16 road. Despite these closures, thee have still been reports of a number of road accidents. Yesterday, a private bus for duty-free shop workers hit a wall at the Jungmun Entrance. Luckily no-one was seriously hurt although two pregnant women were transferred to a hospital for check-ups. 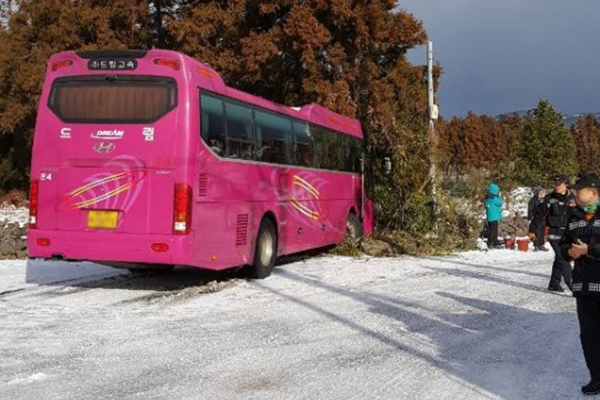 As well as this, the Jeju Fire Headquarters has reported 64 accidents since the start of the snow on Feb. 3 including traffic accidents, falls, and cars that have become stuck in the snow. It seems that we still haven't seen the end of the snowy weather though, with snow set to continue to fall throughout the island until Tuesday afternoon.